A tear gas canister caught Palestinian protester Haitham Abu Sabla in the face. 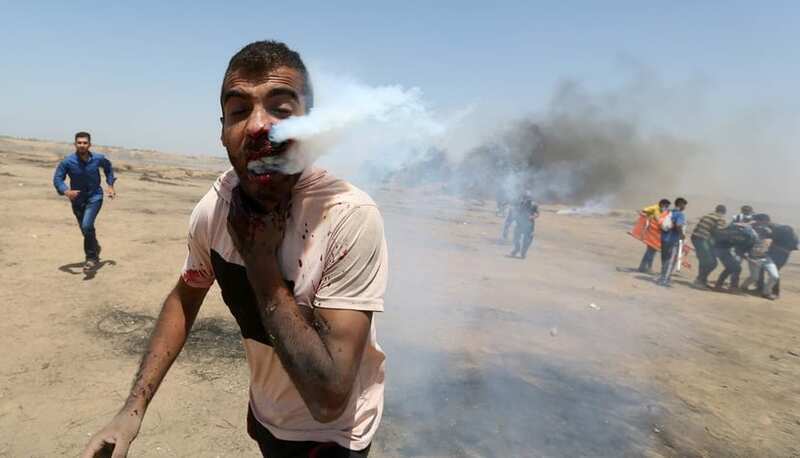 The blood-chilling images show the man splattered with blood, with the canister embedded right next to his nose, with the tear gas still billowing out of it, as well as from the protester’s mouth. Abu Sabla was taken to a hospital, where the canister was surgically removed, and he was placed on life support, his situation is still critical. At least 128 Palestinians have been killed since the protests began on March 30. In the latest case of Israeli attacks on the border, a 21-year-old female Gaza medic was shot and killed while giving first aid to wounded Palestinians. Defence contractors in Isreal then posted a heavily-edited clip online, alleging she was “incited by Hamas” and was taking an active part in the rioting. The US has since promised to veto any protection order for the Palestinians by the UN as ambassador Haley outlined in her public statements two weeks ago. The Israel Defense Forces (IDF) has been cracking down on the months-long protests along the Gaza border, dubbed the Great March of Return by Palestinians, which were started to mark 70 years since thousands of Palestinian Arabs fled or were chased off their land to make way for the newly-established Israel. The demonstrations have seen thousands of Palestinians mass on the border in support of the declared right of Palestinian refugees to return to their homes in what is now contested as Israel. Israel has justified its violent actions by accusing Iran and Hamas of fueling recent violence on the Gaza border that has seen more than 100 Palestinians killed amid protests against Israel.